As a member of the 7 princesses in the 70s she began her television career and sang many themesong for series such as 《大家姐》、《讀書樂》、《那個少女不多情》 and so on. In 1983, she married a man in the culinary world and had 3 children. Justina Shih, Jackson Shih and Jamie Shih. In 1996, after divorcing she re-entered the entertainment circle in order to support her children. She filmed in the TVB series of the time, A Kindred Spirit where her popularity sky rocketed. She was immediately signed to do commercials, models, make up product representatives, female products representatives and much more. Now she is DJ at Metro Radio, where she hosts highly popular shows such as 《家天下》 and 《粵港越流行》beginning her second career. When she was a child, she often sang in her school and took dance classes. At 8 years old, she took part in the movie 《七兒八女九狀詞》 and when she grew up, she became an actress. Up until now, she has been in hundreds of films and has a taken a variety of roles. Later, during her teenage years, she was claimed as part of the 7 princesses with Connie Chan and Josephine Xiao. She then cooperate with them in festive films such as 《雪花神劍》、《玉女英魂》 and 《六指琴魔》. She then released as album called [家燕A Go Go樂隊] which was a hit. It sold over 450 000 copies. In 1996, she came back and acted in A Kindred Spirit. Her role Auntie Ho was highly loved and was widely accepted by the world. In 2001, she acted in an ancient series which eventually lead to the modern sequel, Virtues of Harmony. The series was a hit and ratings kept going up. The series aired from 2001 to 2002, with the original plan of 100 episodes, it had extended all the way to 326 episodes. Her role as Yau Nim Chi was loveable, hilarious and well liked by viewers. Virtues of Harmony then had a modern sequel, where she had to film additional 400 or so episodes. Her role Yau Nim Chi was highly recognized by the entire Asian population. Even the themesong she sings for it, is so popular, children even know it off by heart. In 2002, she released her own book and successfully promoted her Ka Yin Ma Ma image. She then hosted her own show , 《家燕媽媽時間》where she interacted with parents and children in activities. It led to her participation in the multiple children events and shows. In 2005, during July TVb released a Ka Yin Ma Ma cartoon show in which Nancy and a cartoonist cooperated to produce. This show was released in many areas of China. In the same year, she opened up her own acting academy at her community centre where children would be able to show their talents. Music wise, she has released many songs such as 《媽咪Bolo手記》, 《乖仔學堂》 and 《一秒感動》, all which have won awards at TVB Children Song Award Ceremony. In 2001 and 2002 she won the gold award for best song, in 2003 she cooperated with her daughter to sing 《一秒感動》 winning them the Parents Most Favourite Song Award. 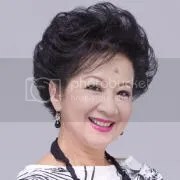 In 2004, her song 《寸草心》 was also quite popular and in 2005 she won Parents Most Favourite Song Award and Top 10 Children’s Favourite Song Award for the song 《媽媽超人》. In 2006 her song 《媽咪點解點解》 and 2007ï¿½ï¿½s Thick love was awarded with Top Ten Childrens Favourite Song Award. In 2006 she acted in another TVB series, Heavenly in-Laws costarring Yuen Wah, Joey Leung and Linda Chung. In Singapore, she acted award winning series Love Concierge. In 2007 she finished filming in Beijing in the modern series,《龍鳳呈祥》 and ATV late bought the right to air the drama in Hong Kong. Her career climaxes again in 2008 as she shows viewers a different side to her in Silver Chamber of Sorrows 银楼金粉. Viewers loved her role as 赛小蝶 in which she was a pitiful, kind yet smart women who married a man that had four wives. Nancy’s portrayal of this complex character who was striving to survive won her a fourth nomination for Best Actress. In 2009, Nancy Sit undergoes two surgeries at once in order to not affect her filming of the grand production, Born Rich. Due to the lack of rest though, it resulted in an infection causing her to be rushed into ICU and Nancy became unconscious for 10 hours. Her illness resulted in her eldest daughter, Justina Shih quitting her job in the States and returning back to Hong Kong to look after her mother. At the same time, Nancy’s scenes in Born Rich were reduced by a half so that Nancy could fully concentrate on recovery. During this period, Nancy’s coworkers including Ray Lui, Jamie Chik, Anita Yuen, Gallen Lo and Kenix Kwok were all very considerate towards her, willing to adapt to Nancy’s schedule. As a result, this further deepend the casts’ friendship.